High quality voice processing is paramount whether you are live on stage or in your project studio. The Vocalist Workstation EX is able to rise to the challenge by giving you great vocals in both environments. 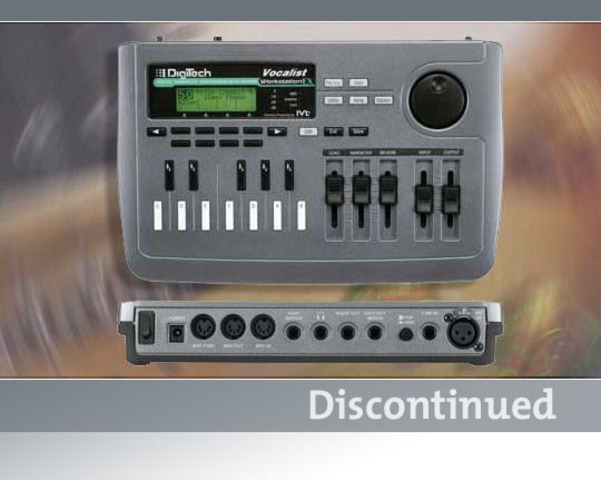 The Vocalist Workstation EX contains a suite of effects designed to make your vocals outstanding as well. It has never been easier to add great sounding 2-5 part harmonies to live or pre-recorded vocals. The high quality Reverb is easy to use and you can edit and store different reverb settings for each program. You can also fix that one out-of-tune note in an otherwise great vocal recording by using the automatic or manual "Pitch Correction" mode. Adjustable gender and humanization for harmony voices make them sound like other singers. When you add a MIDI keyboard, it can create harmonies automatically using its chord recognition intelligence. Full MIDI Sysex implementation also allows the EX to move into the studio to run under full automation with your favorite sequencing and digital recording programs. The Vocalist Workstation EX is the professional's choice for great sounding harmonies in a powerful yet easy to transport design.